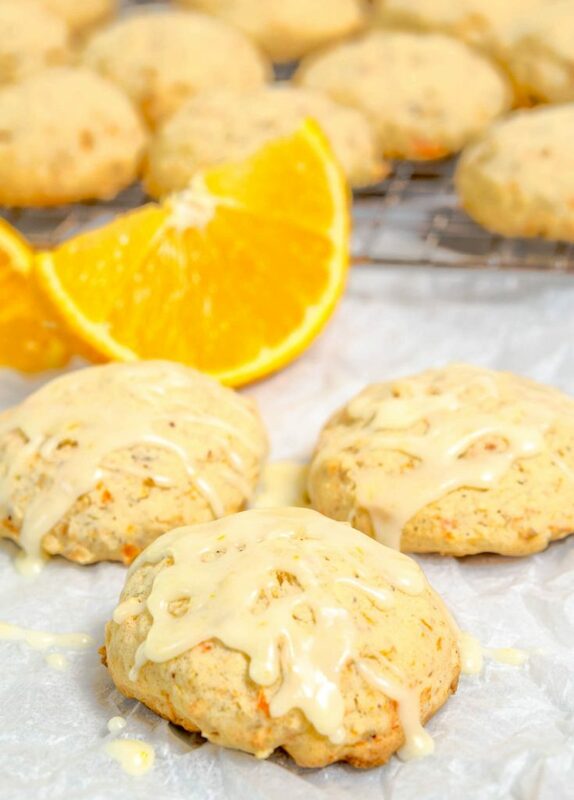 This Citrus Carrot Cookies recipe is slightly sweet, citrusy bright and a little bit like sunshine. These cookies are soft and tender. 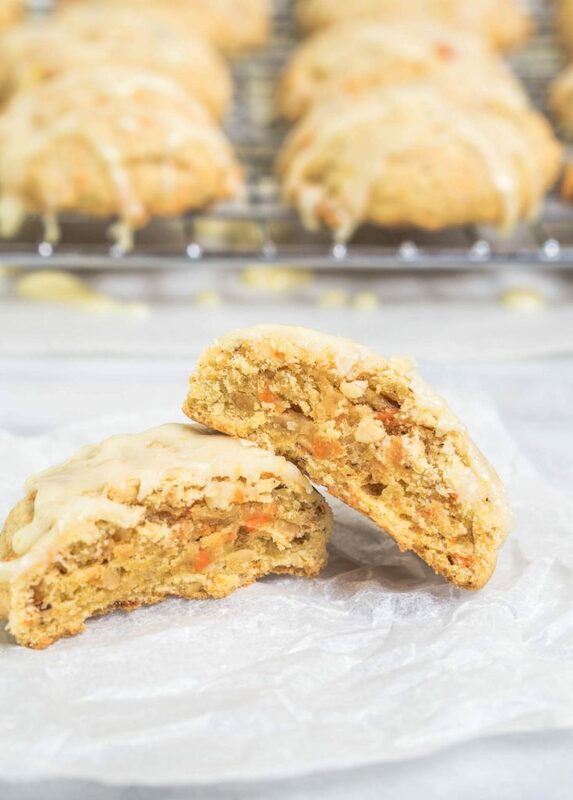 Carrot Cookies are perfect for dessert or a snack. Oh, heavens it’s hot here. Actual temperatures are in the high 90’s with the heat index well over 100 degrees. And, “it’s not a dry heat”. Sorry I couldn’t resist, that saying is kind of funny because hot is hot. The last thing that I wanted to do is turn on my oven, but I’ve been going through baking withdrawal. 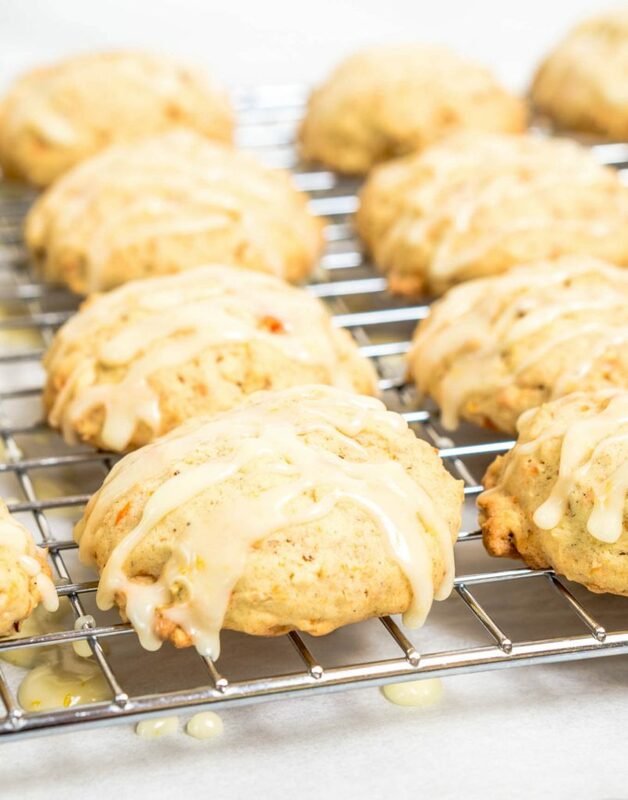 So, the other day I got up uber early and mixed up this Citrus Carrot Cookies recipe. When I was trying to decide what to bake, I came across this recipe for carrot cookies in my family recipe box. I had everything that I needed and hey, carrots are healthy right? The recipe was very basic, and I really wanted to do a recipe makeover. You guys, this cookie is just delicious. They taste fresh and crisp and a little bit like sunshine. This isn’t a big cookie, and it’s not overly sweet. The light citrus drizzle adds a welcome bright sweetness to this cookie. 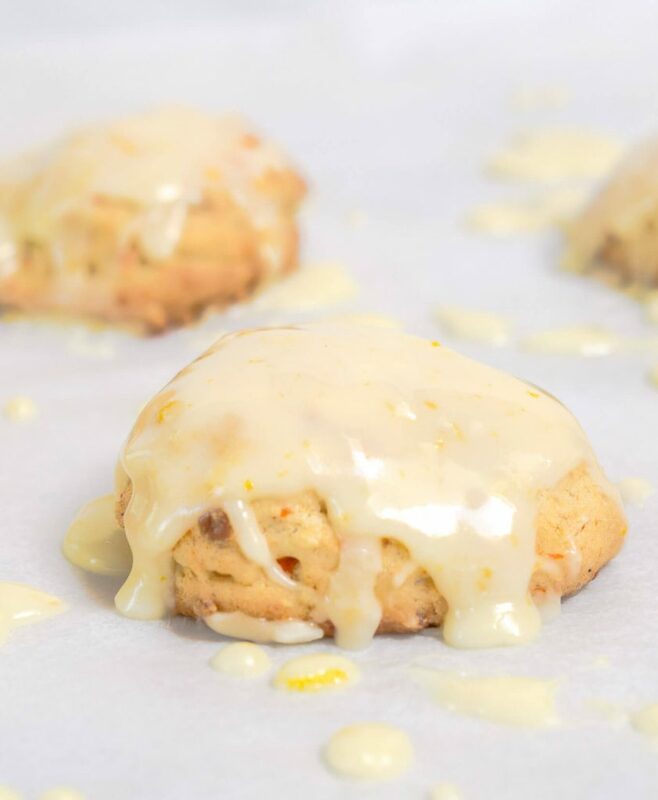 This Citrus Carrot Cookies recipe is slightly sweet, citrusy bright and a little bit like sunshine. These cookies are perfect for dessert or a snack. Preheat oven to 375 degrees F. Line rimmed baking sheets with parchment paper. In a saucepan add carrots and cover with water. Cook until softened. Drain off the water and mash. Allow cookies to cool completely. I used a small food processor to mash them up and didn't mind a few small chunks. In the bowl of an electric stand mixer, cream sugar and butter together. Add 1 egg and 1 cup of cooled, mashed carrots. In a medium bowl, add flour, baking powder, salt, and baking powder. Whisk to combine. Slowly add dry ingredients to wet ingredients. Mix to combine. Add hazelnuts. Using a 1-1/2 tablespoon scoop, drop cookies onto baking sheet. Bake 12 to 15 minutes or until edges brown slightly. Remove cookies to a cooling rack to cool completely. Mix glaze ingredients together and stir until sugar is dissolved. Add more juice to thin or more sugar to thicken. Drizzle or dip cookies with glaze. I had some glaze leftover, so decided to dip a few. These turned out to be John, Mr. Sweet tooth’s favorite! I know I won’t be doing much cooking/baking inside as my air conditioning just quit! Good thing the weather turned cooler.The cookies look delicious especially dripping with the icing! Oh no Judi! That timing was horrible, like usual I guess. My sisters went out too and they were 10th on a waiting list to get an appointment. I’d recommend ice cream…lots of ice cream. Glad it’s a bit cooler. It’s been horrible here. Too hot and humid. I hope you get your air conditioner fixed/replaced before the next summer wave. Julie, these look fabulous, almost like a mini-scone. I’ve pinned your recipe. They have to be healthy because of the carrots. I just got back from visiting my brother in Nashville and it was stinking hot there as well. Very unseasonal for June. Hopefully your air conditioning will keep you cool. Thank you Liz! I appreciate you co-hosting this week, especially as busy as you’ve been! Everything about these cookies looks wonderful! The flavor combination sounds irresistible – like sunshine in cookie form! It has been hot/humid where I live too…I’ve had a few early morning baking sessions as well. Thank you! It sounds hot regardless of where you are right now I think. So, a cookie just makes you feel better about it I think. Can you tell I can justify eating cookies anytime? Julie, these cookies look absolutely delicious ! I have never come across carrot cookies before! Saving the recipe. Thanks for sharing! Have a great weekend! What a great cookie! So perfect for snacking and I bet my little ones will love them! As for me, I’ll probably be munching on them for breakfast 😉 Pinned! Thank you Kathryn! They are perfect for little hands. When I grew up my mother was at work when we got up and breakfast was chocolate cake or whatever we chose. So say yes to cookies for breakfast! Have a wonderful weekend! These are so different and I love your makeover! That lime must be delish! Thank you Mollie! I’ve remembered two weeks in a row! Who says I’m brain dead? Well, maybe me. Have a wonderful weekend! Thank you Marisa! They don’t taste like carrots but stay nice and moist. What cheery cookies for the summer! I bet the hazelnuts and cardamom give them great flavor (not to mention the citrus). I would love one of these right now! You’re right, even though we live in a dry heat, that isn’t very comforting when it is predicted to be 120 next week! I couldn’t believe it when I read that. Hopefully the forecasters are wrong! 🙁 Hope you can stay cool, Julie! Thank you Shari! It’s too hot outside so I’ll just stay inside and eat cookies! I’ve been in AZ during the heat and it’s best inside there too! I hope you stay cool too and thanks for stopping by! Thank you Jess! I know you would go into withdrawals too just looking at your beautiful creations in the kitchen. You know I love citrus in my desserts! Yum! Thank you Debbie! Summer and citrus go together so well in food and beverages!